When drawing a vertical cylinder (you can use a cup or any other cylindrical object), notice that the bottom ellipse and the top ellipse are seen from different angles. The bottom ellipse is a bit more "open" to us, or in other words it has to be wider on the vertical side. Pay attention to the light, shade and the reflected light on the cylinder's side and the way it is used to show its roundness. 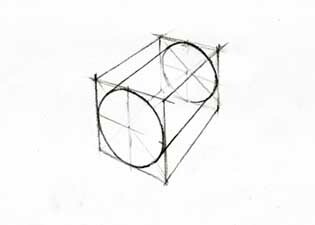 To draw a cylinder from a more difficult angle, you can first draw a box in which the cylinder will be contained and after that draw the cylinder inside the box. Using the box helps us to draw the cylinder from the chosen angle. An example of how to draw a good cylinder by drawing boxes. After some practice you will be able to draw a good cylinder without using boxes. Notice the perspective. 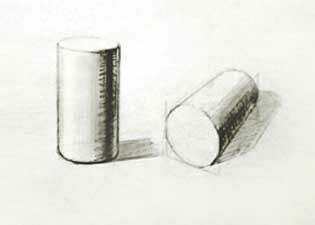 The cylinder drawing from the video.